In the second quarter of this year, the number of names in the .EU extension increased by 32 791, which represents a net increase of 0.9 percent. Currently, there are 3.83 million .EU domain names registered. Compared to the result of the end of Q2 2013, the number of .EU domain names has increased by 122 450 thousand, that is about 4.2 percent. 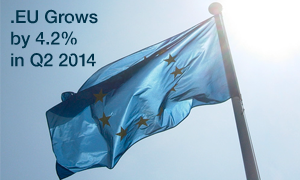 The quarterly results of the .EU domain registration demonstrate that Q3 2014 did not record declines. What is remarkable about that is that, except for the last year, each previous year the number of registered names declined in the second quarter. Monthly analysis points to the increase of the .EU domain registrations, with the exception of a slight decrease in April in comparison to March. The situation on the IDN front does not appear equally enthusiastic. There could be observed substantial fluctuations, and the last quarters resulted in the fall in IDN registrations within the .EU domain. The highest rate of registrations occurred in the Q3 2010 with 67 074 registrations, constituting 2.07 percent of all .EU domain names. From Q3 2013 to the end of Q2 2014 IDN registrations showed declines: from 61 752 registrations (1.7 percent) to 52 499 registrations (1,37 percent). As usual, the .EU domain performed very well in terms of the percentage of domain renewals with 84 percent reported in the Q2 2014. It is correlated with an increase in the number of registrations, which in Q2 2014 was 229 129 – 12 percent higher than in the same period last year, when the number of deleted domains was 192 935. (For the record: .EU addresses go through the 40-day quarantine before the expiry date, during which they can be reactivated by the existing registrant.) The daily net registration was higher by 400 than in the previous quarter. It is worth looking back at the percentage of .EU domain name renewals over the years. The results are really impressive, especially given the fact that during the eight years of the .EU’s operations the results remained virtually unchanged. Particularly impressive are figures for April, when the percentage of domain renewals was as much as 88 percent. Since the beginning of the .EU operations in the net, there has been a consistently growing number of enquiries about .EU domains in the DNS database. This is an important indicator showing interest in that particular domain. In the second quarter, it reached the highest value so far. The .EU extension is now in the eleventh place in the world’s largest TLD ranking – preceding Brazilian domain .BR and Russian .RU. Among the countries with the highest number of registered names within the .EU extension there is Poland, ranking fifth. The ten countries with the largest share of the total registration of .EU domain constitute 87.5 percent of all registered names in this extension. The analysis of .EU domain in terms of the number of .EU names per thousand inhabitants within a country shows that the most “European” country is the Netherlands, with 30.3 domain names per 1,000 inhabitants. The success of .EU depends, inter alia, on political trends in the European Union and the extent to which a business wants to be perceived as European as well as how it is perceived by potential customers and website visitors. If you wish to distinguish your webiste as European or mark a unique presence on the Internet with the .EU extension, please consider registering a .EU domain name. Just click on the extension to obtain more information. Should you need assistance, we can be reached by email at support@web-solutions.eu or via phone on +44 (0) 208 133 3994.